In our increasingly complex financial world, it’s important to discuss the need to have an overall coordinated approach when it comes to financial affairs. Think of 11 players going onto the football field, and hiking the ball without taking the time to get into a huddle and have the quarterback call the play. The chances of these guys getting into the end zone are slim. Without overall coordination of your financial affairs, getting into the financial end zone may be difficult for you as well. Most people don’t think of all their advisors as a team, but it’s important to recognize that most of us already have a financial team; we are getting financial advice from a variety of sources. Your financial team is comprised of your different insurance agents, your CPA or tax preparer, your bank, any investment advisors with whom you are working, and your estate planning attorney. 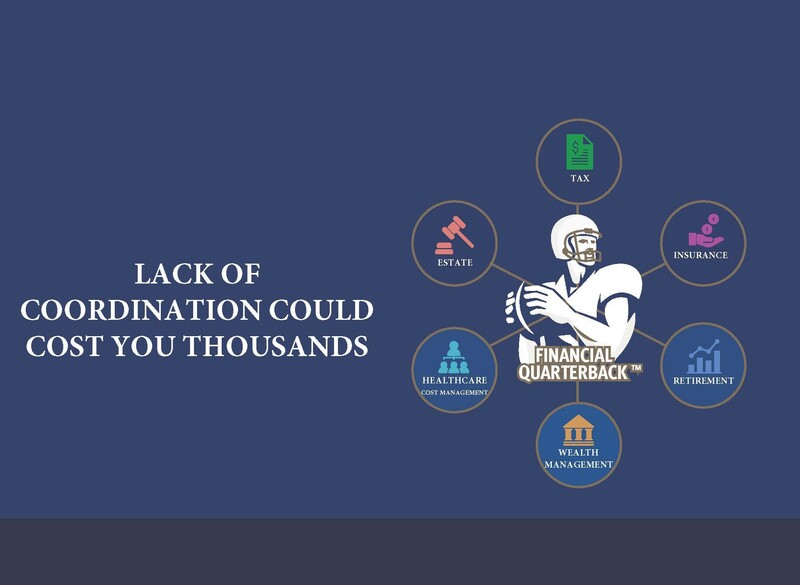 Everyone has a financial team, and they all need a Financial Quarterback. Let’s look at some potential pitfalls of not having a Financial Quarterback. What happens if you take money out of an investment and by doing so you have income to report? Will the receipt of that income trigger taxation on your Social Security? Will it increase your Medicare premiums? You had better know the answer to that prior to making the change. If you have a good financial quarterback, you will know the outcome before you make the change. If not, you may be surprised when you go to file your taxes. Or how about the couple who are taking money out of their IRAs to help cover their monthly living expenses, and at the same time have mutual funds and are reinvesting the dividends and capital gains? They are creating a tax liability by taking money out of the IRAs when they could be using the taxable distributions from their mutual funds to help pay the bills. If there is no overall coordination, there could be mistakes, and those mistakes can be costly. Let me give you another real-life example. We had clients, and unfortunately, the husband had terminal cancer. We worked with them to make sure his pension was triggered so that his wife could get a greater lifetime benefit – almost $1 million in retirement. In this case, the default benefit for this pension--if you didn’t make sure it was the “right” pension –triggered in the right way-- was only 50%! Because he was in a high-risk occupation, we made sure early on that the student loans for his kids were in his name only. We also worked with an attorney to make sure that his will and powers of attorney were in order, so that his wife could have control of the pension and their other assets. So when he passed, because the student loans were in his name only, they were forgiven entirely. That amount then counted as income. However, because we made sure to hold everything in his wife’s name and make sure she had the proper estate planning documents in order, the taxes on the student loans – the ones that were forgiven – hit his estate, which was non-existent. There was essentially no estate for the IRS to bill. So, that amount was forgiven as well – well over $40,000. I think that story really illustrates how having a Financial Quarterback™ can really save you time and money, especially in a situation like this one. Sure you can, and, if you don’t have someone in that role, guess what, you are your own Financial Quarterback! So you want to ask yourself – are all the members of your team talking? Do you have time to pour over the many advisors out there, the thousands of financial products, to know what’s best for you? Do you take the time to watch the markets, or have access to proprietary models and research to help you ensure you are making the right decisions? As you can see, without the proper education and experience this is a difficult role to fill. We tell people who want to take this role on themselves: be prepared to get your shins kicked in a few times. If you are young you can take it, but as you get older it takes much longer to recover. The same thing applies financially. How long will it take you to recover if you make mistakes? Will you be back in the game next week, or will you be on the injured reserve list for the rest of the season? As we always say at Lineweaver Financial Group, one size does not fit all. You and your family have unique needs based on your specific situation. If you’re wondering how well prepared you and your family are, we offer a no-obligation risk analysis, to help give you peace of mind. To schedule time with an advisor, you can call us at 216.520.1711, email us at quarterback@Lineweaver.net, or click here. This explanation is provided for information purposes only and is not to be construed as or considered to be tax advice. You should always consult a tax professional for advice on your individual situation.